Jo Malone, why did you leave your company just when it started getting awesome?? Jo Malone has always been a very British brand, which is to say that the earlier fragrances were understated, staid, and perhaps a bit unexciting. You knew what to expect from a Jo Malone: demure florals or lightweight citruses. In the six years since its founder left, however, Jo Malone has become significantly more diverse. We’ve had perfumista favorite Dark Amber and Ginger Lily, the unexpectedly rootbeer-esque Vanilla & Anise, the delectable Rose Water & Vanilla, the blockbuster Tea Collection, and now Blackberry & Bay. I’ll get right to the point: it’s great. Better than I could have hoped. I loathe fruity fragrances, and you can bet your bottom dollar that I’ll be buying a bottle of this. Blackberry & Bay opens with the deliciously savory combination of bay leaves and grapefruit. There’s a lot of grapefruit in here, and it does an perfect job of keeping the (very realistic) blackberry note tart rather than overly sweet. The cedar base note isn’t particularly exciting, but like most Jo Malones, Blackberry & Bay is rather faint by the time it reaches the drydown anyway. The lasting power is frankly bad (one hour at best), which is why I’ve deducted one Harajuku Lover from the rating. However, Blackberry & Bay isn’t as light as most of the other Jo Malones. Fruity perfumes are too often the olfactory equivalent of Ryan Lochte: awfully pretty, but not much brainpower. Blackberry & Bay manages to be both mouthwatering and terribly sophisticated. I’m seriously thrilled with it, and I suspect that you will be too. I don’t write all that many enthusiastic posts, so I thought that this one might call for a disclaimer. As usual, I acquired my sample of this fragrance by harassing a Nordstrom salesperson. No samples or full bottles of this fragrance were provided to me for consideration by the company. Good to know! I’ll try it out, even though berries aren’t my thing (we can be pretty close to Evil Scent Twins, but I need more data to tell for sure!). What I am worried about is what will be removed from the arc? I need to find out. I have already missed out on them doing away with Sweet Lime and Cedar in favor of Wild Bluebell which I am less than wild about, arrrrggggghhhhh. Have you heard which one is to be nixed? No, I didn’t even realize that one Jo Malone was nixed every time a new one was introduced! But I predict that it won’t be Wild Bluebell, unfortunately, since I’ve been seeing a lot of promotion for it this summer. Argh, I know. Not Wild Bluebell. I don’t generally love Jo Malones – they are so darn FAINT! And so POLITE! And I like blackberries, but they usually wind up in partnership with rose and vanilla… hmm. I’m intrigued by the bay. This one is really vivid, and not at all sweet, like a rose-vanilla-blackberry would be! I think that you might like it, Mals! Jo Malone lasting power is SO BAD. One of my favorites, Black Vetyver Cafe, literally lasts TWENTY MINUTES. If there was anything else on the market that smelled like it, I would switch over immediately. I was looking forward to trying this perfume but I’m also concerned with its staying power (or lack thereof). There are many Jo Malone’s perfumes that stay on my skin for hours but at least several recent – Cherry Blossom, Plum Blossom and Wild Bluebell hardly survive 15 minutes. It’s completely unexceptable! I hope this one behaves better. Completely concur that the recent releases have been even lighter than usual. And I am not amused that the poor lasting power has come with a price increase! An extra $5 isn’t the end of the world, but $60 for 30 oz of extremely weak perfume is not much or a bargain. Thanks for sharing dear! I’ve been keen on trying some Jo Malones but the brand is not available in Poland and I can’t get samples from them (don’t want to buy a sample from ebay where sample would be cheaper than shipping costs) so I have to rely on foreigner friends. Thanks to them I tried 3 so far. Which ones have you tried, lucasai? Are there any in particular that you’d like to try? I would be happy to be a generous foreign friend! I didn’t used to be much of a Jo Malone fan, but I’ve become more interested in the line recently. Yaay, thank you Ari! So far I tried French Lime Blossom Cologne, Lime Basil & Mandarin Cologne and also Blue Agava & Cacao. 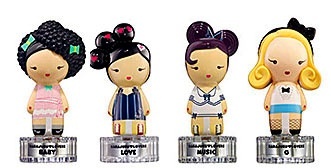 I’d love to try Jo Malone Grapefruit, English Pear & Freesia, Black Vetyver Cafe, 154. But at most I’d like to give a try to Iris & Whitr Musk from Cologne Intense collection and Amber & Lavender. Going perfume smelling tomorrow (payday!) . . . will be on the lookout for the B & B.
Whoooo! If you find it, please tell us what you think! Got a whiff of the Blackberry Bay. I like it and I am very intrigued because I don’t have anything like it. To me, it is not just the berry, it is the whole plant, even the little prickly thorns. It has been almost two hours since I sprayed and I still smell it on my skin. Don’t think it is a full bottle for me, but a decant might be nice! Also, I am greatly distracted by my other arm which has Un Jardin En Mediterranee . . . this is full bottle worthy . . . I can’t get enough . . . I love Un Jardin En Mediterranee, too! Definitely full bottle worthy. 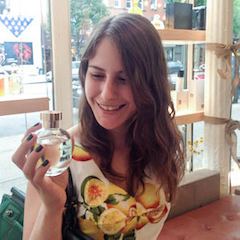 I have a non-perfumista who just bought a bottle, so clearly even the “common people” enjoy it! 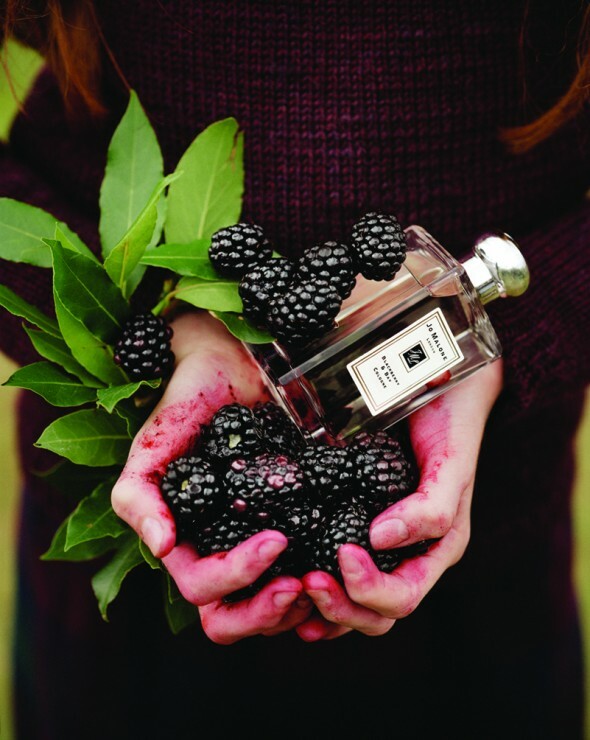 I have an aversion to fruity scents too…but a tart blackberry does sound intriguing. Wonderful review. Thank you so much, laniersmith! I promise that this is not your typical fruity, berry scent! I am going to hold you to your promise! OK, you got my attention. Will check this out the next time I’m doing a sniffing expedition to the Holt. Sometimes it pays to have scent glue skin. Can’t wait to hear what you think of it, Dionne! I would pay at least $15 to have scent glue skin. AT LEAST. Woooow, what a generous rep! I’m glad to hear that you enjoyed it, too! You know I don’t think I have ever knowingly smelled a Jo Malone. I lived in England and everything but nothing so linear ever appealed. But Bay in a perfume sounds ace, but I will have to wait for a Jo Malone fairy to fall from the sky as I don’t have a clue where would stock them in this big (non English) country town. I am exceptionally delighted by your Hariku Lover rating which I haven’t noticed before, is it new or am I just very unobservant? You are absolutely not unobservant, killerrabbit! The rating system is far from new, but I never remember to use it! I am lucky to have many Jo Malone sources near me, and would be happy to send you a sample of this and some others if you’d like! The only Jo Malone I have is Pomagranate Noir. I bought it in a fragrance chronicles set which has 3 smaller bottles in it to combine with the main fragrance. I forget the exact names but there is Raspberry, some lily scent, and a wood. I’m not big on berry scents but the raspberry isn’t super sweet so maybe this Blackberry and Bay would be worth a sniff. PN lasts a reasonable time on me but that’s why it’s the only one I’ve bought because the rest of the line lasts about an hour. Maybe that’s the plan, get the consumer to use it up faster and therefore need to buy another bottle. So great to hear that you got such good lasting power out of the Blackberry and Bay! I never got to try the Earl Grey and Cucumber, I really wish they’d bring the tea series back!